(1) TURING POPCORN TEST. “Movie written by algorithm turns out to be hilarious and intense” promises Ars Technica, where it’s free to view. Knowing that an AI wrote Sunspring makes the movie more fun to watch, especially once you know how the cast and crew put it together. Director Oscar Sharp made the movie for Sci-Fi London, an annual film festival that includes the 48-Hour Film Challenge, where contestants are given a set of prompts (mostly props and lines) that have to appear in a movie they make over the next two days. Sharp’s longtime collaborator, Ross Goodwin, is an AI researcher at New York University, and he supplied the movie’s AI writer, initially called Jetson. As the cast gathered around a tiny printer, Benjamin spat out the screenplay, complete with almost impossible stage directions like “He is standing in the stars and sitting on the floor.” Then Sharp randomly assigned roles to the actors in the room. “As soon as we had a read-through, everyone around the table was laughing their heads off with delight,” Sharp told Ars. The actors interpreted the lines as they read, adding tone and body language, and the results are what you see in the movie. Somehow, a slightly garbled series of sentences became a tale of romance and murder, set in a dark future world. It even has its own musical interlude (performed by Andrew and Tiger), with a pop song Benjamin composed after learning from a corpus of 30,000 other pop songs. Longtime fan Hobbit, whose preference is to go barefoot, was particularly upset. I and a traveling companion were some of the first casualties … we only made through less than a day there before simply bailing out. While the barefoot issue was only about a third of what pushed me over my limit by the time we put it all in the rearview, I complained bitterly to Marriott’s customer-care department [as Renaissance is one of their brands] about the way we were treated. Hobbit has posted the complaint letter and corporate replies. I would like to lodge a formal complaint against your property at Renaissance HarborPlace, in Baltimore. I was there for an event scheduled through this past Memorial Day weekend, May 26 – 30 2016, to help with its technical setup and operations. The event was a science fiction convention named Balticon, in fact its fiftieth year in existence, put on by the Baltimore Science Fiction Society (BSFS). This was its first year at this particular hotel property, and may well be the last. Within mere minutes of arriving to unload gear and begin building our technical infrastructure, I and several of my colleagues were harassed by the hotel security staff for not wearing shoes. Some number of my crew generally work without shoes for an extensive set of positive reasons, including but not limited to increased agility, comfort, *safety*, and situational awareness. While perhaps a bit unusual in the relevant activities, it is our personal right and freedom to enjoy and presents no unacceptable risk or concern to either ourselves or the venues we occupy. The many health *benefits* of going barefoot are also well known. We accept full responsibility for our own care and safety, and at that level it is not up to any other entity to dictate to us about it either way. The harassment continued and escalated through that evening, even after our staff offered a temporary compromise by confining our activities to our assigned function space and slipping on shoes to go elsewhere on the property. The only shoes I had with me were effectively light-duty slippers which would cause me to be significantly *less* surefooted and safe while working, and thus were not a viable option. This was also true of our other staff, who only had open-toe sandals and other seasonally-appropriate footgear on hand. Ultimately I was unable to continue working the convention setup, and wound up simply leaving the entire event prematurely because it seemed like the only reasonable option left open to me…. Hobbit also has barefoot advocacy information online. In early 2016 I began to correspond with some of the other online barefoot advocates in my area, and participate in various group activities like hikes and dinner gatherings. I viewed this as further support in my own journey, particularly with helping bring awareness and reason to typically stodgy organizations that harbored some unreasoned sixties-holdover fear and loathing for bare feet. In keeping with my own personal tradition of advising any number of companies on best customer-facing practices in the online world, it seemed a short step to use those same techniques and reach out to them to discuss customer and client policy decisions about footwear in an escalated fashion. (3) UNDER CONSTRUCTION. The Digital Antiquarian begins an opus about “god-game” development with “SimCity Part 1: Wil Wright’s City in a Box”. I think the primary goal of this [SimCity] is to show people how intertwined such things can get. I’m not so concerned with predicting the future accurately as I am with showing which things have influence over which other things, sort of a chaos introduction, where the system is so complex that it can get very hard to predict the future ramifications of a decision or policy. When SimCity was finally released, the public, including plenty of professionals in the field of urban planning who really should have known better, credited Wright’s experiment with an authority it most definitely didn’t earn. I’ll return to this point in my next article, in the course of which we’ll try to figure out what so many thought they were seeing in Wright’s simplistic take on urban planning. After working on the idea for about six months, Wright brought a very primitive SimCity to Brøderbund, who were intrigued enough to sign him to a contract. But over the next year or so of work a disturbing trend manifested. Each time Wright would bring the latest version to Brøderbund, they’d nod approvingly as he showed all the latest features, only to ask, gently but persistently, a question Wright learned to loathe: when would he be making an actual game out of the simulation? You know, something with a winning state, perhaps with a computer opponent to play against? Back when I was nineteen years old and steeped up to my innocent ingenue ears in the Matter of Britain, I dreamed up a story – technically a novel, I guess, seeing as it was over 40,000 words, but not much over. It was a solid chunk of writing, though, pretty much written over a year or so when I was about 18, and it told the story of Queen Guenevere…. Today, I know of this madness. I understand it from within. I take no issue with his comments, not from this side of the bridge of time, because he was probably right – my story was one of innocence rather than guilt and machinations, my Queen was a child caught up in an adult world, much as I was at the time. But when he wrote this report, I had yet to read Kazantzakis. I had heard of Zorba the Greek, but I had not read the book, nor seen the movie at that time. (5) DEPRESSION ART. MD Jackson reminds you of everything you’ve forgotten (or never knew) to answer the loaded question: “Why was Early Comic Book Art so Crude? (Part 1)”, at Amazing Stories. A friend of mine recently asked why it is that the artwork in comic books has gone from being so crude and rudimentary in the beginning to being so much more photo-realistic today. Well, I thought that was a good question, so I am setting out to answer it. And although the question seems simple, the answer is not, and it will take more than one post to fully cover. Were the early comic book artists untalented hacks? Or did the early limitations of printing technology hamper their creative expression? The answer, in my view, boils down to: a bit of both. June 10, 1692 — Bridget Bishop was the first person to be hanged at the Salem Witch trials. (9) DINO DUDES. Den of Geek has “Jurassic Park 4: new concept art from lost film”. If you Frankensteinized the DNA of the Hulk, Wolfman and a velociraptor in a petri dish, you’d get Raptorman. He was due to appear in a Jurassic Park film, but ltimately it wasn’t meant to be. Raptorman was part of a screenplay envisions by John Sayles and William Monahan when they were penning an earlier take on Jurassic Park 4, featuring genetically enhanced soldier-o-saurus reptiles created by a corporation to be mercenaries that are supposed to wrangle the rogue dinos trampling North America. (10) DELANY. From Shelf Awareness: Image of the Day: NYS Writers Hall of Fame. For the seventh year, the Empire State Center for the Book inducted a group of diverse writers into the New York State Writers Hall of Fame. 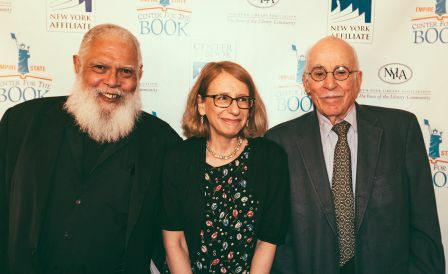 Honorees Samuel R. Delany, Roz Chast and Roger Angell (pictured, l.-r.) attended the June 7 event at New York City’s 3 West Club, where Maya Angelou, Jean Craighead George, Grace Paley and Don Marquis were recognized posthumously. Stephen Sondheim was not able to attend due to illness. In his acceptance remarks, science fiction writer Delany told of his fondness of fellow inductee Don Marquis’s famed characters Archy and Mehitabel. (11) INDIEGOGO. Scholar Kenneth James wants to raise $60,000 of support for his work on “Autumnal City: The Journals of Samuel R. Delany”. Currently I am compiling and editing Delany’s personal journals. The journals will be published by Wesleyan University Press in what is projected to be a series of at least five volumes, with each volume covering approximately one decade’s worth of material. I have recently completed the first volume, In Search of Silence; this volume is now in the final stages of production at Wesleyan and is slated to appear at the end of this year. It covers the period from Delany’s teenage years in the late 1950s to the end of the 1960s, during which time Delany established himself as a major figure in what came to be called New Wave science fiction. The second volume, Autumnal City, will present Delany’s journals from the 1970s, during which time he wrote the bulk of what many consider the pivotal work of his career, Dhalgren (1975), as well as Trouble on Triton (1976), the first volume of the Nevèrÿon tetralogy (Tales of Nevèrÿon ), and many works of criticism. In this campaign I am seeking funding to produce the second volume. If I secure this funding, the project – which involves researching, compiling, transcribing, editing, and annotating the text – will take two years to complete. The total amount I am seeking, for two years of full-time work on the project, is $60,000. There has been $1,355 pledged to date, and the appeal has 2 months to run. (12) JOURNAL EYEWITNESS. Matthew Cheney enthsiastically endorses the project. I’m just back from spending a few days at the Delany archive at Boston University, and I’ve looked through a few of the 1970s journals. They’re truly thrilling for anybody interested not only in Delany the writer, but in the writing and thinking process in general. They’re especially interesting for those of us who think that after 1969, Delany’s work only got more brilliant. They are working journals, not really diaries as we generally think of them, and they clarify a lot of questions of when particular things were written, and why, and how. That makes them, if nothing else, of immense scholarly value. But they’ve also got material in them that just flat-out makes for good reading. (13) ENVIRONMENTAL MESSAGE SF. “Sharman Apt Russell Guest Post–‘BFF: Science Fiction and the Environmental Movement’” at Locus Online. In 1864, a hundred years after the start of the Industrial Revolution, the American scholar George Perkins Marsh wrote about the impact of a society rapidly cutting down its forests, destroying its topsoil, and polluting its water. Marsh thundered, “The ravages committed by man subvert the relations and destroy the balance which nature has established, and she avenges herself upon the intruder by letting loose her destructive energies.” He predicted an impoverished Earth with “shattered surface,” “climatic excesses,” and the extinction of many species, perhaps even our own. In his own way, Marsh was an early science fiction writer. (14) DO YOU WANT TO GET PAID? Peter Grant’s Mad Genius Club post “Writing your passion…or not?” makes an argument for avoiding saturated markets. The commenters overall favored passion-directed writing. In the same way, I see authors trying to ‘break in’ to the market in a particular genre and getting discouraged. That may be because it’s a crowded genre (e.g. romance and/or erotica) where there are already lots of books and authors and it’s hard to get noticed; or it’s a field where there are relatively few readers in relation to the overall book market (e.g. those interested in the domestic life of the Polynesian parrot! ); or it’s a moribund genre which hasn’t attracted interest or support from either publishers or big-name authors for some time (e.g. Westerns). To authors facing such challenges, my advice is: Why not try to write in a genre where you will be noticed, and where you can offer a quality product that will attract reader interest? You may not be passionate about that genre, but is that any reason not to try your hand at it? (15) OLDERS Q&A. “Malka Older and Daniel José Older Discuss Infomocracy, Cyberpunk, and the Future!” — Leah Schnelbach covered the event for Tor.com. There was already a nice crowd gathered for the concatenation of Olders at Greenlight Bookstore, and by the time the reading began, the seats were full, and many people already had copies of Malka Older’s debut novel, Infomocracy. The novel takes us into the near-future, twenty years after Information, a powerful search engine monopoly, guided the world in a shift from a fractious collection of nation-states to global micro-democracy. Now the world is entering another election year, and idealists, policy wonks, spies, and rabble-rousers are all struggling to see which democracies will come out on top. Older read, and then her brother, Bone Street Rumba series author Daniel José Older, joined her in front of the crowd for a lively interview and Q&A. You can read the highlights from their conversation below! (16) SILENT MOVIE. Here’s a video documenting what Mystery and Imagination Bookshop looked like on June 9, 2016. This entry was posted in Pixel Scroll and tagged Alma Alexander, Balticon, Daniel Jose Older, Hobbit, Jurassic Park, Kenneth James, M.D. Jackson, Malka Older, Matthew Cheney, Mystery & Imagination Bookshop, Peter Grant, Samuel Delany, Sharman Apt Russell, video games by Mike Glyer. Bookmark the permalink. @jim henley I agree, Delany is a masterful writer – though I am glad there never came a point with Wolfe where I thought I just can’t follow you where you want to go. I really loved Nova, Triton, and even Dhalgren, though bare dirty feet kind of gross me out too and that seems to be one of his most enduring fetishes (whether it originates with the myths of heros like Jason missing a sandal or from personal experience, I don’t know …). I will probably buy these from Wesleyan when they are released, or at least the first one to see if I can digest it. I am glad SF figures like Delany have been getting a lot of academic attention and hope it continues. (Of course he works in academia, but still). If Lafferty, Avram Davidson, Cordwainer Smith, and Wolfe could be household names like Faulkner, Joyce, or Hemingway (is flannery O’connor a household name?) we would be living in a pretty awesome world. I’ve never had a publication project fail to deliver. Delays happen all the time. I probably have 100-300* campaigns which haven’t delivered yet which funded over the last 12 months. Many of them I don’t get rewards from as I back at $1-5**. I keep track of how they are doing post-funding and offer advice if they hit bumps/problems. I started crowdfunding in 2011. I believe ~1,000 of the campaigns I’ve backed are publishing related in some way. In most crowdfunding one doesn’t get refunds if the project fails as the money has been spent. It’s a risk one takes. I’ve had less than 0.5% of the projects I’ve backed be what I consider failures – most from bad quality of what I recieved not lack of delivery/project failing. **$1-5 is how I can afford to have backed so many projects. Some I’ve backed at higher levels. There are lots of ways a small $ backer can help campaigns from promoting to advice to support and more. A church or the Red Cross are also competing for my dollars in the sense you’re discussing, in that there is a finite supply of “my dollars” and I am going to make a choice how to spend them. And is also a free market, in that there is no compulsion (no legal one anyway) on contributing to it. Charities have folded due to lack of funding after all – in a free market, people have merely purchased another competing “good” – frex another charity, or an Xbox. As a long time con-runner i can categorically answer from personal experience: “It’s Marriott”. I can totally believe this, but I have 400,000 Marriott points, so I’m kinda locked in. Weston hotels have been very good to our local conventions. Heck, last Windycon the hotel provided pizza in the lobby to all attending fen, with no charge to the fen or to the convention. I asked the hotel liaison and he told me it was the hotel’s idea; they appreciated the business and wanted to make their customers feel welcome. The above report about Marriott does NOT give me a warm, fuzzy feeling. As a very occasional consumer of hotel rooms (yay local cons), I like Marriotts. But I too have heard of the hassles regarding events. I’ve only contributed to one crowd-funding project, but it went perfectly and I got my copy of the thing. It is odd that you won’t get a copy of the Delany book, but I guess Wesleyan wants to sell books. If he can get the $60K to live on and work on the book, more power to him — but that’s a LOT of cash and I’m not sure the warm fuzzies will make up for later having to also pay for the book. Whatever, it’s got to end better than the crowdfunding for gadgets that never arrive; at least more of Chip’s stuff will be deciphered. And it’s a HELL of a lot better than sucking up to a racist sexist fascist homophobe. Nothing is worth that stain on your soul and your reputation. Do your due diligence and explore all your options, people. Phew, the atmosphere is getting thick in here…. @steve davidson: I think all of my RISK games with my brother ended up with the board upended and the pieces scattered everywhere. Mike: it ain’t good for your reputation, that’s for sure! I thought upending the board and pieces flying everywhere was written into the instruction manual of RISK. SimCity just did it with disasters and kaiju. If I knew upending the board and pieces flying everywhere was part of RISK I might have risked playing it. My eyes glazed over each time someone explained it to me. I suspect it’s me I’m still at go fish & Sorry & Yahtzee for games. I believe my 6-7 year old niece is gaming at higher levels than I am… If she’s playing the games I buy her. I get more feedback on the STEM kits. I did hear the family was enjoying the chemistry games I sent. We have a copy of The War on Terror: The Board Game, where if I recall, using nukes and biological warfare are both possibilities. And players pass around the Balaclava of Evil. Back in the early 80s my friends and I invented Nuclear Risk (or adapted it from something someone had seen somewhere; I no longer remember) — you play Risk normally but with Irkusk designated as the nuclear trigger. When that card came up, everyone played out the round, cashing in whatever cards they could and de-concentrating their armies as best they could. Then all cards were gathered and dealt out face down; they became nukes. (Leftover cards got their own stack and played as rogue nukes every turn.) The first three cards in each stack were “blind nukes”; after that you could pick up the cards and play your nukes strategically. You can take a normal turn, or do a nuke; flip a card, remove all armies from that space (even if they’re yours) and put two of your own armies on that space. (Wild cards, you can designate a space.) Then your turn is over. As you can imagine, this plays havoc with the traditional huge buildup of armies on, say, Brazil…. Cassy B – In high school, I also played a variation we called Nuclear Risk. Every third turn, the country cards are shuffled and one card is drawn. All armies on that country are instantly obliterated and you lose half your amies if you have to move across it. You marked those countries with a penny. This variation made the game end faster but sometimes the winner was just the last unobliterarted player. Hi. The Wesleyan book is now one of the items given for the fund-raiser. We simply didn’t know that the fund-raiser was going on before. The proceeds of the fund-raiser do not come to our press. They are to help support the expenses of the person editing the journals. 🙂 Thanks! Yes, that was probably Nuclear War. I used to play that (along with the first two expansion sets) a fair bit in University. There was another expansion set later on as a tradeable card game. I’m not suprised that the peaceful option worked: the entire point of the game was how futile the whole idea was, and the ‘I’m not a threat’ option was always a workable option in the game so long as you didn’t have too many players who just love beating up on defenseless people.